Summer is the best season to shoot photos. After these 3 moths you’ll have tons of pictures from your vacation, open air hangouts, BBQ parties that you might share with friends on your Facebook page. If you want to add an artistic look to your images, first of all, you should try PhotoMania, a Facebook fun photo editor with over 250 free photo effects. Obviously, to use PhotoMania, you need to have a Facebook account. Then visit the Apps section and type “PhotoMania” in the search box. Facebook will trigger PhotoMania app for you. As you launch the app, you see the PhotoMania start screen that offers several groups of photo effects: sketches, paintings, cartoons, fun, modifications and a few more. Each group contains dozens of effects. Just click the type you want and choose a photo from your Facebook photo albums. The selected photo effect will be automatically applied to the image and you will be able to download the photo with the effect or share it on Facebook immediately. To make it clearer, watch a video tutorial on how to add photo effects to Facebook photos with PhotoMania. What I mostly liked about PhotoMania is the ability to add effects to your friends’ photos and the photos tagged with your name. 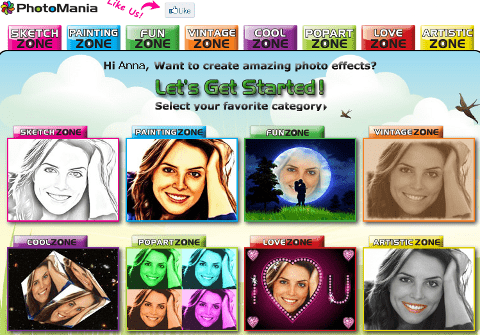 This option lets you present your friends with awesome collages even if they do not use PhotoMania yet. This can be a good way to say “thank you”, “I love you” or “I miss you” to the nearest and dearest on Facebook. Besides, such cute collage can cheer up, be a great ecard, a Valentine Day card or a message to the best friends. It's needless to say your friends will appreciate your attention. 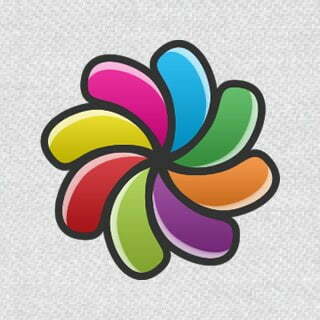 Upon the whole, PhotoMania is simple, but probably, the most suitable photo app for Facebook you should know for sure. However, it has a few drawbacks. The app page is full of tricky ads that you may be a bit confused where to click next. And the photo editor asks for permission to post on your behalf on Facebook, though you can reject it and still use PhotoMania. So try PhotoMania right now. wil (scrapbooking) idee skep. Kan julle my asb help? Iewers moet 'n (free Download program) wees maar wa? Try PhotoScape it's truly free program for scrapbooking. I have used this one and it's a good one but you're limited to only adding to the photo. The best that I have used was called Picnik. Google bought them, It is no longer available. Is there one out there that is similar to Piknic?